Following the opening number, the Air Force Band had a well-timed fly-over. Not by a Stealth Fighter or the Blue Angles, but a flock of Canada Geese headed towards Chandler's shores to make their 1-pound daily deposit. It was a great family event, and they even provided the DEET. 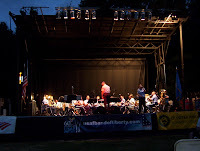 This year will have an encore event: on Thursday, July 24th, the Air Force's jazz band will be playing an outdoor concert at the same venue at 7:00 pm. The site is on the western edge of the pond in the open, grassy field -- Gallagher Park. BYO lawn chairs, blankets, and picnics. No, I don't mean where you end up if you have a loud party. As part of the Neighborhood Crime Watch Unit’s National Night Out celebration, each of the 11 Boston Police Districts will be hosting neighborhood celebrations. These events provide an opportunity for community members and police personnel to mingle, exchange ideas and form new relationships. Attendees will enjoy complimentary food, family friendly entertainment and activities. Boston Police District D-14 (Allston-Brighton) 10:00 am - 2:00 pm at 301 Washington Street. Come and see the station's new handicapped-access ramp out front. Chew the fat about who had the worst office in the trailers during the renovations. Enjoy the landscaping out front. Watch the emergency room construction across the street at St. Elizabeth's Medical Center. And please: no more theater jokes. In what is hopefully not a bad omen for Boston College's proposed ten-year, $1 billion capital construction project, questions surfaced in the last week over the city approval process for renovations underway at the library on BC's new Brighton Campus. How did neighborhood residents sense something was going awry? A week or two ago a construction truck drove down one-way Lake Street, the driver probably realized his mistake, and then he backed up several hundred feet in order to get to an entrance into the Brighton Campus -- the former St. John's Seminary land purchased by BC in 2004-7. At the October 16, 2007 meeting of the BC Task Force at which the library renovations were discussed, I had mentioned that construction vehicles ought to enter the Brighton Campus only through the Commonwealth Avenue entrance. A logical extension is that no construction trucks should travel down Lake Street or Foster Street -- particularly since the latter has a posted 2.5 ton weight limit banning heavy trucks. BC officials seemed to nod in agreement. After seeing the truck go in reverse up Lake Street, several residents thought that there ought to be a construction management plan (CMP) for the renovation work -- and that it ought to say that there would be no truck traffic on Lake Street. Queries to BC and the BRA caused city workers to scramble for a few days to figure out what was going on -- and if the city's processes regarding the construction work were being followed. The BRA requires large development projects to negotiate a signed CMP with the Boston Transportation Department after BRA Board approval but before construction begins. The problem: there wasn't a CMP on file for the library renovations. In the end, everything appeared to be OK: BC told the BRA that renovation work on the library only started after the city issued a building permit on June 18th; and the BRA determined that a CMP was not required for the renovation work because the BRA had issued a "notice of exemption" for the work on May 14th. And BC officials apparently told their contractors in no uncertain terms what entrance they should be using. The renovation work on the library provided an opportunity to get an update on BC's institutional master plan amendment first filed in October 2007. The "notice of exemption" of May 14, 2008 was issued by the BRA because the library renovations, with the exception of a handicapped access ramp, were entirely interior to the building. While the library renovations are still formally part of the IMPA, the notice meant that BC could proceed with them without waiting for approval of the IMPA itself. The public comment period for the IMPA closed on June 6, 2008 without any letters received, according to BRA project manager John Fitzgerald. Since that date, BC and the BRA appear to have been too busy with other issues to follow-up on the IMPA. Even though Article 80 review dictates that a BRA Board vote should follow soon after the close of the public comment period, it has not yet taken place. Nor has the Zoning Commission taken it up. Fitzgerald offered his assurances that, when the St. William's renovations are approved, the BRA will make sure that a construction management plan is signed with BTD prior to the start of any construction work. And that no more trucks would be backing up on Lake Street. Image of a dump truck by cindy47452 provided through a Creative Commons license. With the tensions having risen between BC on the one hand and the residents and mayor on the other, now would be a good time for BC to: postpone its planning process for a few extra months; go back to the drawing table to improve its plan; engage with the city and community in an iterative process to modify it; and, in the end, produce a consensus plan that accommodates the needs of everyone, not just BC. One particular way in which the city ought to consider requiring further review is that the purchase of the apartment building at 2000 Commonwealth Avenue -- and subsequent proposal to convert to an undergraduate dormitory -- were not part of the original institutional master plan notification form of December 2007. In reading the 409 pages of public comments I was unable to find a single case where a letter writer requested BC to purchase off-campus buildings, nor did I find a case where a letter writer used terminology such as "university-controlled housing" or "university-owned housing" when calling for BC to house all their undergraduate students (the term "on-campus" was the typical language used in the letters). The issue of an off-campus undergraduate dormitory was not raised in the IMPNF and, as a result, the public comments did not consider that possibility. The Boston Redevelopment Authority has therefore not issued any kind of scoping determination on BC's proposal for an undergraduate dormitory at 2000 Comm Ave. Now would be the time to do so. The Boston Landmarks Commission will be holding a hearing on Tuesday, July 22nd regarding a request by Boston College to demolish three houses at 188, 192, and 196 Foster Street. Thomas Keady, Jr., BC's Vice President for Governmental and Community Affairs, told the now-defunct BostonNOW newspaper last year, "Those three houses will be coming down." The three houses are located on the corner of the five-acre lot bought by BC from the Archdiocese of Boston. (One house and its comparatively small lot was purchased from a private seller in 2006.) BC has proposed to demolish all three to make way for a 75-bed Jesuit seminarian and theology graduate student housing complex as part of the re-affiliation of the Weston Jesuit School of Theology with BC. The three buildings date to the time period 1870 - 1885. BC submitted their demolition request to the city, and the BLC will hold this hearing in order to determine whether or not to invoke a 90-day demolition delay under the Article 85 process. Harvard University, on the other hand, followed such an alternative path 25 years ago with their University Place development -- preserving two houses by incorporating them into their new development to positive reviews from the community. Rehabilitation alternatives should include additions to the existing houses and/or compatible, adjacent new construction. Feasible alternatives that would preserve and protect the historic properties should be adopted and implemented. The houses "display elements of Victorian eclectic style and are fine examples of this period and type of construction," according to the MHC letter. All three houses are identified in the appendix of BC's IMPNF as listed on the National Register of Historic Places. This opinion is not substantiated with an explanation as to how these buildings are representative of any style or construction, not does it address subsequent changes to 192 and 196 Foster Street which seriously detract from their integrity. 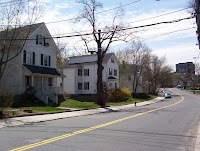 The MHC and BC dispute whether or not the three houses lie within the "Upper Foster Street Area," which is part of the MHC's Inventory of Historic and Archeological Assets and is an area that the MHC said "meets the criteria for listing in the National Register of Historic Places," or the "Foster Street Area," an area that the MHC has not commented on regarding its eligibility for the register. The Foster Street houses were built by Horace W. Baxter on the southern end of his Baxter Estate, according to an email provided by Brighton historian Bill Marchione. The property traces its prior lineage back to Reverend John Foster, "Brighton’s first resident minister (and namesake of the street), and his wife Hannah Webster Foster, the first native born American female novelist," according to Marchione. Mrs. Charles Eldredge (aka "Fanny Fern") -- "the most popular female writer/ journalist of her day" and author of the novel Ruth Hall -- also lived on the estate. The Foster Rock is located on the opposite end of the five-acre site from the houses. BC's proposed development would not modify the granite outcropping. How Can the Public Comment? The BLC hearing will be at City Hall on Tuesday, July 22nd at 6:25 pm in Room 900.
the outcome of the community meeting held prior to the hearing. the availability of other sites for the Applicant's intended purpose or use. In evaluating alternatives to demolition, the BLC may consider such possibilities as the incorporation of the building into the future development of the site. Also on the agenda for the July 22nd meeting is a design review meeting regarding the proposed demolition of the gas station at 332 Chestnut Hill Avenue and construction of a five-story residential building with retail on the first floor. The design review application will be considered at 3:30-4:00 pm, and then discussed by the BLC and voted on at 5:30 pm. Note that the July 22nd meeting of the BC Task Force was postponed to July 29th in order to allow people to attend the BLC hearing. Residents, local elected officials, and Mayor Thomas Menino have all argued for increased undergraduate housing on BC's main campus, while BC has argued for locating new dormitories on the former St. John's Seminary land -- and converting their recently-purchased apartment building at 2000 Commonwealth Avenue into a dorm -- based on the argument that any increased housing would make the main campus too dense. Now BC's director of public affairs, Jack Dunn, increased his rhetoric again by saying Tuesday night that the housing on part of their Chestnut Hill campus is so dense that to find denser housing "you would have to go to a prison." Dunn's prison remark was met by a series of moans -- "aaaawwwwwwww" -- from the crowd. They weren't buying it at all. Dunn's prison argument against housing density, as it turns out, rests on analysis of a gerrymandered map of BC's Chestnut Hill campus. A fairer comparison without using a gerrymandered map shows that BU has a substantially higher housing density on their campus than BC has on their Chestnut Hill campus. By drawing the lines in such a way, Dunn makes the argument that BC's proposed housing plan places 4700 students in 40 acres comprising part of their "lower" Chestnut Hill campus. In fact, by drawing the lines this way, Dunn and other BC officials have actually mixed up the boundary between lower and middle campus in their diagram -- including some parts of the middle campus (those that have dorms) while excluding some parts of the lower campus (those that don't have dorms). The 6/14/08 presentation commits the misrepresentation to writing by referring to the map above as part of "lower campus area studies," when in reality the area enclosed by red -- and the statistics drawn from it -- includes buildings from the middle campus. In particular, the dorms Gabelli, Ignacio, Rubenstein, and Voute Halls, and 66 Comm Ave, are all identified as middle campus dorms in their DPIR (Table 6-1), yet are strangely included in the "lower campus area studies" diagram. Draw the lines differently, say, to reflect better the underlying geography and you would get a different answer in terms of student beds per acre. One thing is for sure: gerrymander the area studied and you'll always get the answer you want. In making his case for a campus prison, Dunn was, in effect, implying that Boston University ought to be renamed Boston Prison University, because its undergraduate housing density is substantially higher than BC. Just compare the housing density in BC's entire main campus at Chestnut Hill to BU's entire campus in the Kenmore neighborhood. No gerrymandering required. BC currently houses 6455 students (DPIR Table 6-1) in their 118-acre Chestnut Hill campus (DPIR page 1-5), corresponding to 54.7 beds of housing per acre. BU currently houses 10,617 students on their 133-acre campus, corresponding to 79.8 beds of housing per acre -- 46% more dense than BC's campus. These numbers will not surprise anyone who has seen the tall dormitories that BU has built in order to house their students: BU has a higher housing density than BC. Just stating the obvious. And I don't think anybody would call BU a prison. Spokesman Dunn continued to try to make his density argument against new, main campus dormitories by pointing out the usage of all the other facilities there. "It's other functions in that part of campus" that contribute to the density issues, such as the Rec Plex (or its proposed successor, the Recreation Center). He estimates around 8000 students use the student center daily, and around 4000 students per day use the Rec Plex. The problem is: by adding more students into the calculation, the addition of 500 beds of undergraduate housing to the lower campus becomes even more diluted, weakening his argument. By adding all the extra users of the student center and Rec Plex, those 500 more student beds appear to have a more minimal impact. Probably not the conclusion he was shooting for. A little piece of advice: stick to the housing argument sans Rec Center. The BC Task Force will be meeting during July to consider various parts of the revised institutional master plan (the draft project impact report) that BC submitted to the city on June 20th. All meetings are 6:30-8:30 pm, Brighton Marine Health Center, 77 Warren Street, Brighton. Note that none of these meetings is the one that the BRA is required to hold under the Article 80 review process, so there will be at least one more meeting in addition to those listed above. These meetings will differ from previous ones in that there will be no presentation by BC officials -- since most attendees are quite familiar with their institutional master plan. Task force members will be facilitating the meetings as an opportunity to hear community feedback, so there will be no time set aside in the agenda for BC officials to present the plan or answer questions. City officials (e.g., BRA and other departments) are likely to attend; the task force is, after all, an official advisory body of the BRA. The attendance of BC officials is unclear: this is a public meeting, so they may attend if they wish, but the task force appears neither to have invited nor discouraged them from attending. At previous meetings during the comment period of the IMPNF, at least one BC official stated publicly that they would be happy either to attend or not -- whatever the community and task force would prefer. (Harvard's counterpart has made the same offer to the Harvard Allston Task Force.) A peculiar situation unfolded in the four January meetings, in that the BC officials were asked to sit in attendance -- yet say nothing as the neighborhood residents made various comments and posed questions. In general, those questions weren't answered because the format didn't allow it. It was an odd format, and several of the BC officials appeared visibly uncomfortable. This week I have heard from quite a number of Brighton residents, all of whom have told me that they would prefer that BC officials not attend -- since the format appears to avoid allow back-and-forth discussion between residents/task force members and BC officials. Last week's public meeting of the BC Neighbors Forum had only residents in attendance (plus a few reporters and a couple of elected officials' staff members), which allowed the discussion to be thorough and very lively. There is little question in my mind, based on experience, that the discussion is far more frank when only neighborhood residents attend. We'll see how the task force addresses the situation Thursday night. While Mayor Thomas Menino spent a couple of days last week in various interviews with reporters stating his opposition to key elements of Boston College's undergraduate housing proposals in their revised institutional master plan, he forgot to mention one thing: BC's proposed conversion of the apartment building at 2000 Commonwealth Avenue into an undergraduate dormitory would remove more than $400,000 from the city's tax rolls, because BC is a tax-exempt institution. Today, Menino, through his spokeswoman, took aim at the college. "He believes BC should make that up somehow," said Menino press secretary Dorothy Joyce. "They don't do as much as their counterparts, and he'd like to see them do more." Missing from the story is that the building is currently heavily under-assessed relative to similar, nearby comparable apartments; the city should be pushing for $660,000 in increased PILOT, not $424,000. Mayor Menino's comments Tuesday echo earlier comments by District 9 Councilor Mark Ciommo, who called into question the wisdom of BC removing the property from the tax rolls. Missing from the story is that the apartment building appears to be significantly under-assessed relative to a comparable apartment building in the immediate neighborhood. The apartments at 2000 Comm Ave are typically split between 1-bedroom/3-room units with 700 square feet assessed around $165,000 (e.g., #806), and 2-BR/4-room units with 1000 sf assessed at around $240,000 (e.g., #805). Comparable apartments at 1933 Comm Ave across the street are 1-BR/4-room units with 660 sf assessed at nearly $280,000 (e.g., #408), and 2-BR/5-room units with 1150 sf assessed at $350,000 (e.g., #403). At $36 million, the total assessed value for the 188-unit apartment building at 2000 Comm Ave is therefore under-assessed; a more accurate assessment would be around 56% higher, or $56 million. The current property taxes for the entire building ought not to be $424,000 per year, but instead 56% higher, or $660,000 per year. Note that 2000 Comm Ave is also a more modern building than 1933 Comm Ave and offers a range of additional, luxury amenities -- including the swimming pool in the photograph, spectacular views of the Chestnut Hill Reservoir, and others features you can see at Archstone's website. So, if anything, 2000 Comm Ave should be assessed even higher than the comparables. When Mayor Menino is pushing for BC to increase their PILOT to account for the property tax payments on 2000 Comm Ave, the city should use $660,000/year as the baseline for negotiations -- not $424,000/year. Why would the apartments at 2000 Comm Ave be so heavily under-assessed? I can only speculate that the developers of the building managed to get a "sweetheart" deal with the city to assess the property so low -- but, admittedly, I have no evidence whatsoever of any such agreement. It's a good question to ask the city's Assessing Department. Is Raising PILOTs an Implicit Acceptance of the Conversion to a Dormitory? One other problem with Mayor Menino's statement on Tuesday is that, as long as BC continues to operate the building as open market rentals, they already have to continue to pay property taxes since the property is not an "institutional use." Only if and when it switches to institutional use -- such as if it is converted into a dorm -- does the loss of property tax revenue come into play and the modified PILOT is a way to address it. By raising the PILOT issue now, it sounds like Mayor Menino is implicitly accepting that BC will convert the building into a dorm. Doesn't the city have a say about the conversion? Doesn't BC need approval of that conversion both through the Article 80 review process (requiring approval of both the BRA Board and the Zoning Board) and through a city-issued dormitory license? If so, then the city could easily erect hurdles for BC by blocking their move through either the Article 80 review or the required dorm license. University PILOT vary widely in their amount. Harvard University pays Cambridge, Watertown, and Boston a combined $5.1 million, while BC pays Newton and Boston a combined $315,000. Better uniformity in the PILOT would make sense, particularly since BC has demonstrated that they are not in dire straits -- having paid $173.4 million for the St. John's Seminary land in 2004-7 and $67 million for 2000 Comm Ave last month. The Boston Globe reports on a green movement they dug up: growing your own produce in your backyard -- or maybe even the White House's gardens. With the price of fuel sky-high and the average produce traveling 1500 miles to reach your local grocery store, locally-grown produce is a way to cut down on U. S. consumption of fossil fuels. Probably a more concrete trend is the interest in Community Supported Agriculture, where members collectively purchase shares of a local farm's products by providing up-front cash in the winter or spring -- when the farmers need the money to plant crops. Since the farm is located not far from the consumer's house, minimal fuel is needed to transport the produce to the customer for a weekly delivery. 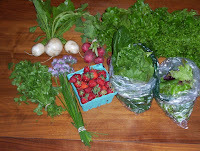 Purchasers of a CSA share typically receive a weekly distribution of produce from late spring to mid autumn. The variety of vegetables, fruit, and herbs are seasonal. The system is a shared-risk and shared-reward for consumer and producer. It's local produce, but Not In My Back Yard. CSA's such as these date back to the 1960s in Germany or 1980s in the U. S. Current estimates are that there are current between 1300 and 3000 such CSA's in the U. S., although one report puts it at 1080. I have been receiving weekly deliveries of produce from the Red Fire Farm in Granby, a central Massachusetts town located around 90 miles west of Boston. The farm is a great place to observe the landing route for roaring, low-flying Air Force jumbo jet cargo planes at the Westover Joint Air Reseve Base in neighboring Chickopee, if that's your thing. It's still early in the season, so quantities and variety are a bit limited, but one week's haul in the early season might be: a couple zucchini or summer squash; a head or two of lettuce; bunches of turnips, radishes, or large pearl onions, all always with the greens still attached; a bunch of garlic scapes [picture at top right], which are the cut tops of garlic (something I've never seen anywhere else! ); a head of kale or collard greens; rosemary, dill, cilantro, or chives (with chive flowers); cabbage; and strawberries. While the advantage of this approach over backyard vegetable gardening is that you don't have to break your back in the process, additional strawberries as well as various kinds of peas are labor-intensive to pick, so many farms allow share-holders to visit and pick-your-own. Image of garlic scapes by urtica provided through a Creative Commons license. The Massachusetts Appeals Court ruled Thursday that the physical search in 2004 of student Amenhotep Smith at Brighton High School, which led to discovery of a loaded handgun with four rounds of hollow-point ammunition, was reasonable and that the evidence was correctly allowed in his 2006 trial. Smith was convicted at trial of unlawful possession of a firearm and ammunition. Defense counsel had argued at appeal that the search violated the Massachusetts Declaration of Rights which, the appeals court noted, "in some circumstances... affords greater protection against arbitrary government action" than the Fourth Amendment." An assistant headmaster at the school searched Smith's jacket and found the handgun and ammunition. 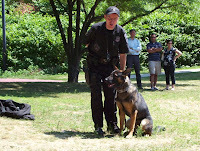 In his findings, the motion judge determined that the search was justified based on three factors: the defendant's violation of a school rule by his presence in the hallway during class; his violation of a school rule by his failure to enter the building through the authorized entrance, namely, the front doors, which are secured with metal detectors, during specific arrival hours; and his failure to follow an arranged plan of dropping his belongings in Prieto's office at the start of the school day. As such, the appeals court appears to have adjudicated the case based on the facts and case law, rather than calling into question more fundamental issues related to unreasonable search and seizure or the relation of Massachusetts to federal law. The appeals court ruling upholds Smith's conviction on the gun and ammunition charges for which he was sentencde in 2006 to one year in prison. See also: Allston-Brighton TAB and UniversalHub. Image of handgun by robertnelson provided through a Creative Commons license. The Brighton-Allston Improvement Association meets on the first Thursday of every month from 7:00 - 9:00 pm at the Elks Lodge, 426 Washington St., Brighton Center. All BAIA meetings are wheelchair accessible and open to the public. For more information, call 617-787-1299. Three days, three stories. A three-day news cycle. Mayor Thomas Menino is extremely unhappy with Boston College, their institutional master plan, and the "arrogance" of the university's leaders. Monday, Banker & Tradesman reported that Mayor Menino called BC's plan to house all their undergraduates "double speak" -- because they would do so partly with off-campus, not on-campus, housing. Tuesday, the Boston Herald refers to his dislike for BC's tactics in trying to win approval for their IMP, particularly the email and/or letter that they sent to alumni asking those in Boston to contact city and elected officials to express their opinions on the IMP. More broadly, Menino deplored BC's tactics in advancing their proposals, saying the college has not heeded doubts expressed by the neighborhood and the city. "Confrontation doesn't work," he said. "I'm saying to them, 'Let's work together and stop pitting people against each other.' There has to be a balance between the interests of the city and the college." In a wide-ranging and sharply worded criticism of the plan, Menino said that he squarely opposes the college's recent proposal to convert a high-rise apartment building about one-third of a mile from the Jesuit university's main Chestnut Hill campus into a dormitory. Menino also faulted BC's plans to build new dorms on property it purchased from the Roman Catholic Archdiocese of Boston, and disputed the college's contention that it cannot fit more students on its traditional campus. "I want them to build on the campus they have right now, not buy up property and turn it into a dormitory," he said in an interview. At Monday night's public meeting of the BC Neighbors Forum, there was some discussion about the extent of the Mayor's opposition to either or both of BC's housing proposals. His direct quotation as it appeared in the Banker & Tradesman story did not express outright opposition to either proposal, but instead he said that he would "rather see them live up to their commitment to house all of the students on campus.” Maybe only a preference -- possibly even a strong preference -- but not clear opposition. The Globe story put such word parsing to bed. Mayor Menino opposes both, unequivocally. And, on top of that, he wants BC to find space on their main campus in order to locate the new dorms adjacent to their current dorms. In particular, I ask that those of you who are residents of Boston express your support to elected officials, especially district city councilors and the BRA. That language makes it clear that the letter is addressed to some alumni who live outside of Boston, but that the request for an expression of support was only made to those recipients who are also residents of Boston. Menino took particular exception to a recent effort by BC administrators to lobby city officials in support of the plan. In a June 27 letter, president William P. Leahy wrote that it would be "most beneficial to have expressions of support from Boston College alumni and employees who live in the city of Boston." When Jack Dunn, Director of Public Affairs at BC, told the Globe that "Leahy's letter was sent only to BC employees and graduates who live in Allston-Brighton, as well as a small number of graduates who live in other parts of the city," it is more likely that he was referring only to the June 27th letter -- while presumably selectively avoiding discussing the June 24th letter (which appears to have been distributed more widely). The Boston Herald came in with another article Wednesday, "Mayor: BC off track with dorm plan," in which they report that Mayor Menino "stopped short of saying BC needs to back out of the apartment-building deal" which closed last Monday. "They've purchased it... I'll always work with BC," said Mayor Menino. The Herald's reporting did not note, however, whether or not the Mayor supports BC's proposal to convert their newly-purchased apartment building into an undergraduate dormitory -- a glaring omission. Wednesday's Globe story filled in the gaps by noting his opposition to the dormitory conversion plan, not the purchase itself. "I want them to build on the campus they have right now, not buy up property and turn it into a dormitory," he said. Image of Boston Globe by ckirkman provided through a Creative Commons license. The Boston Herald quotes Dot Joyce, spokeswoman for Mayor Thomas Menino, as saying that “The mayor is opposed to [Boston College's] tactics" in pushing for their revised institutional master plan. This Institutional Master Plan is critical to our future, and I hope that all members of the Boston College community will take the time to review it and then assist in the approval process. In particular, I ask that those of you who are residents of Boston express your support to elected officials, especially district city councilors and the BRA. Joyce said the mayor’s “double-speaking” remark was only a reference to BC’s alumni letter, which didn’t mention that 2000 Commonwealth Ave. is off-campus. The Herald correctly reports that the alumni letter did not specifically mention 2000 Comm Ave, but the Banker & Tradesman direct quotation from Mayor Menino clearly puts it in the context of 2000 Comm Ave, since he mentions it by name. I'm not sure if the Herald got it wrong, or if Joyce did. Joyce stopped short of saying Menino outright opposes BC’s master plan, especially its purchase of 2000 Commonwealth Ave. - about one-third of a mile from BC’s main campus and where the college hopes one day to house hundreds of students. The Suffolk County Registry of Deeds Monday recorded the purchase by Boston College of the apartment building at 2000 Commonwealth Avenue for $67 million.